Erika Meyer stood in front of about 20 third graders and had their rapt attention as she held a booklet up with a picture of a race car. "This is what you're going to make," she said. Almost in unison, the children breathed out in an excited gasp, "Yes." 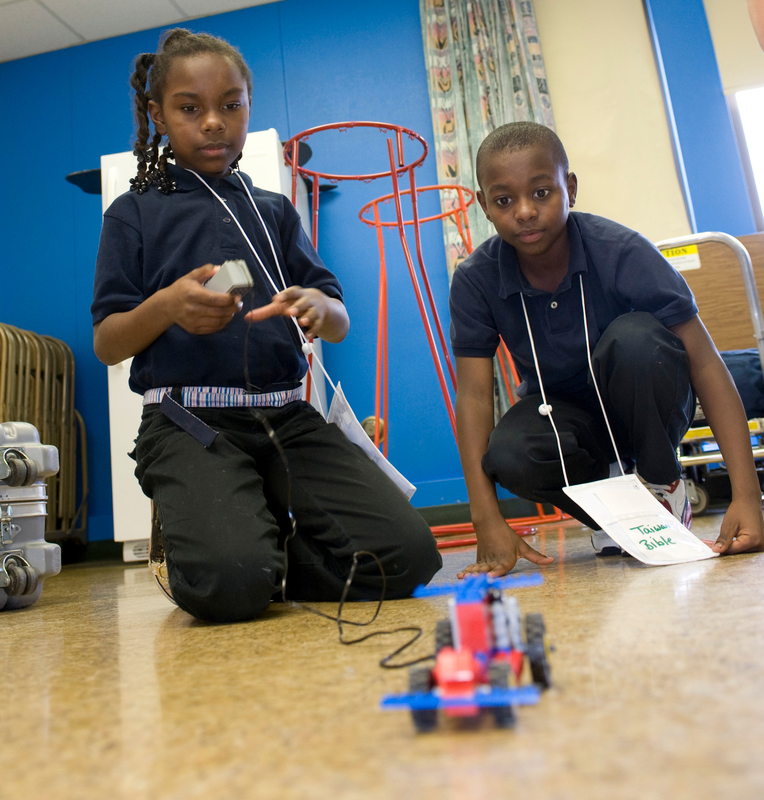 The students at Miller Elementary School in Indianapolis divided up into pairs and worked with Indiana State University education majors to build motorized race cars out of Legos as part of a project funded by the Jordan Fundamentals Grant Program. "Hopefully, we want them to take back some ideas never to give up, to keep trying. If their race car was not successful at first, to go back and rework it and see where the problem was and how to make it better," said Meyer, a third grade teacher at Miller. "Building it is just putting pieces together. Of course, that's important in anything that you do, but we really just wanted them to get some self-confidence and build their self-esteem that they could build something and make it run." Mykala Johnson agreed that it was a fun experience, especially as she and her partner were the first to finish assembling their car. "We went step by step, we had a smile on our face and we just did it," she said. 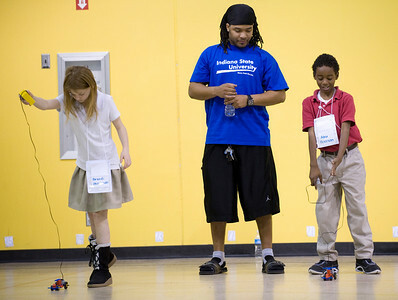 They also learned something about fixing problems with their car during a race in the school's gym. "It kept on getting stuck," she said. "On our first race, it didn't start up so I had to push it down to make the gears connect and then it started working better." Third-grader Caleb White wants to build another car, one that will go faster. "I want to race other people's cars and see if I win," he said. He also wanted to tell his siblings about his experience, and he had a message for the other students. "If you haven't tried it, you need to because it's fun," he said. That fun experience fit some specific goals, according to Kathy Bauserman, ISU assistant professor in elementary, early and special education as well as professional development liaison with Miller Elementary, who wrote the grant. "One was the science and math component in their being able to build the Lego race car and get it to actually work, and the other one was the emotional and behavioral support through the ISU mentors who came and helped the students with their project," she said. Such an experience was beneficial, not only for the children, but also the ISU education majors who acted as mentors for the project. "Every single group got to build, successfully build and race the car," Bauserman said. "The ISU students got the experience of working in an after-school project like this, working with inner-city children. They may not have had that experience before and satisfaction in knowing that they were able to help students be successful." Brooke Barrow, a senior education major from Bloomington, said working with the elementary students gave her more experience in the education field. "It's one on one, or I have two kids, and you really get to see how they think when they look at a picture and how to build it," she said. It was a lot harder than I thought. My kids did a good job though they taught me a lot." Bauserman said the third grade students were disappointed to learn the activity was a one-day event. "I think that indicated the extent of enjoyment," she said. "They got a taste of it and they wanted more."